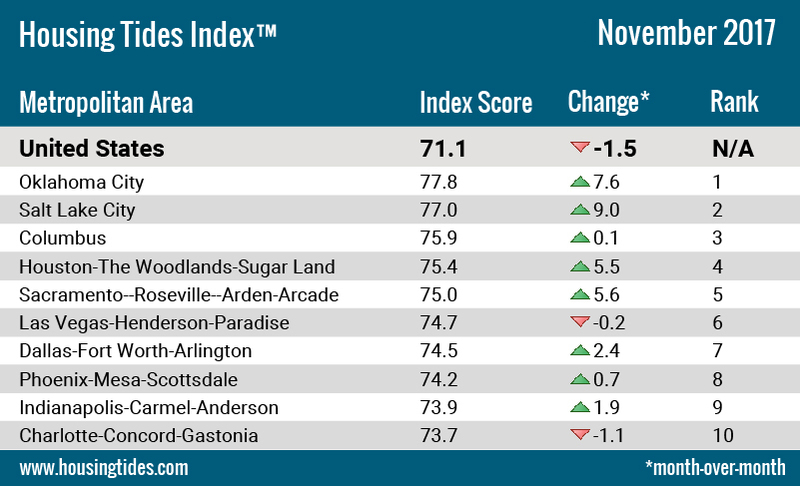 The Housing Tides Index™ increased by one point this month, reaching 71.1 after recording a value of 70.1 in October. However, the Index remains lower than its level of 72.6 in November 2016. 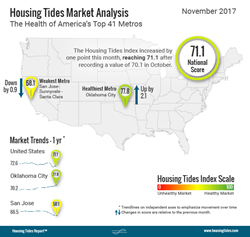 This week marks the release of the November Housing Tides Report™, featuring an update to the Housing Tides Index™, an objective and sophisticated approach to quantifying and comparing the health of U.S. housing markets. The biggest driver of the small rise in the Index this month is the improvement in housing supply, which moved from 2.8 months of supply in August to 3.3 in September. Still, this level of supply is lower than that of a healthy, balanced market and we must note that this increase was due entirely to a 17% decrease in the number of home sales. This exceeded the drop in for-sale inventory, which fell month-over-month and in September marked the eighteenth consecutive month of year-over-year decreases. The increase in the months of supply measure could therefore be attributed to a combination of the typical seasonal sales slowdown and some price resistance among potential homebuyers, with the median sales price increasing 7.5% in the last year, a pace considerably higher than that of wage growth. Strength in the U.S. employment market continued in September as the unemployment rate fell to 4.1%, its lowest level since late 2000. This strength was expressed in the October Consumer Confidence Index, which reached its most optimistic level since December 2000. Consumers noted improvements in both present-day conditions and the short-term economic outlook, though a slightly smaller share of respondents expected an improvement in short-term income prospects. As we noted in June, the number of apartments under construction reached a forty-year high this summer and rental rates have been affected by the stream of completed units coming to market; the national median price for a two-bedroom unit fell year-over-year in each of the last eight months. Median monthly rents for these units have fallen by over $200 since mid-2014, from $1,750 in June 2014 to $1,545 in September 2017. Remarkably, these rent decreases have taken place at a time when much of the new multi-family construction in the U.S. has been in the high-cost luxury category. Taking a big-picture view, this trend should be beneficial for renters that have struggled to save for a down payment while home prices have continued their march upwards. Multi-family housing permits have totaled 292.9k through the first nine months of 2017, marginally higher than the same period in 2016, so we can expect the trend of moderating rent prices to continue in the short term. Single-family permit approvals fell further than expected in September, with 32,400 approved in aggregate across the 41 Tides markets. Multi-family permitting was characteristically volatile, falling 15.7% in September with just 23,000 permits approved in the month. However, the six-month moving average was little changed at a rate of 25,000 permits per month. Please reference the attached graph to view the Ten Healthiest U.S. Housing Markets - November, 2017. Media Exclusive. Housing Tides Media Monthly Pulse. Subscribe to our email service exclusively created for media which delivers an updated infographic depicting the latest monthly Housing Tides Index, the complete Index as it appears in the Housing Tides Report™, and a brief executive summary. All content can be shared in print and digital publications, with attribution to the Housing Tides Report. Members of the media can subscribe to the Housing Tides Media Monthly Pulse here. Housing Tides™ (“Tides”) is the only monthly report that provides a comprehensive measure and aggregated understanding of the health of the U.S. housing and home building industry. Designed to take the guesswork out of the vast amount of forecasting information published about this sector, Tides is a sophisticated report that delivers city-specific, updated information when market conditions change. It is the only report that uses natural language processing and machine learning to correctly understand and synthesize large volumes of data, making it more comprehensive, balanced, and reliable than any other report of its kind. For further information, please visit housingtides.com and connect on Twitter, Facebook and LinkedIn.